Petscaping is a new trend in landscaping where the design keeps that special pet in mind. The idea is to protect your furry four legged creatures from poisonous plants and harmful chemicals all while keeping your cherished plants safe from your curious and sometimes destructive pets. If your pets safety is of the utmost importance it’s important to know that some chemicals and even mulches, like cocoa mulch containing theobromine, can be highly toxic to animals. If you use pesticides or week killers it’s important to make sure these are safe for your pets and for your children. Pets and children alike love rolling and playing in the grass so it’s time to make it safe! Is your landscaping going to the dogs? 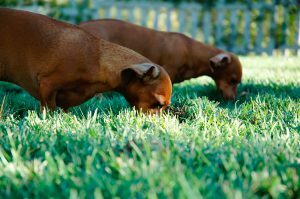 Landscaping can become riddled with urine spots because dogs and lawn grass don’t mix well. Effective landscaping with your pet in mind begins with a compromise rather than fighting it, plan your yard around your pets predictability. Here are some great tips and starter projects to turn your yard into a safe place for everyone to enjoy. Many pet owners enjoy watching their furry friends running around the backyard, but regret sets in when you see them dig up your favorite plant or create their own path when on patrol. Dogs love to patrol and in most cases they will create their own paths. If there is a existing dog path in your backyard, you can turn that muddy walk way into a inviting walkway with paw- friendly materials. 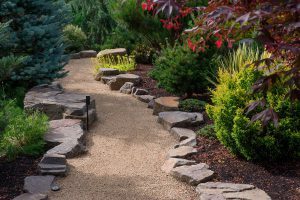 Hardscapes are a low maintenance alternative to grass that obviates lawn care. Stone and masonry are especially useful for pooch owners because it minimizes the mess that dogs can make through digging. No More dragging dirt into your house! Crushed stone mulch is durable and minimizes the mess dogs make through digging and urination. If you decide to put plants in your garden use drought resistant plants since stone tends to get hotter in the summer. Don’t put it directly against your plants either. Make use of both for a contrasting look. You can build a brick, concrete, or flagstone patio as a look out platform. Remember dogs are territorial and have sharp instincts to guard their homes. You’ll see how much your pet will enjoy it. Every pet is different and has their own personality, some love to dig, others want to escape. Installing a fence keeps everyone safe. You can choose whatever type of fence that matches your home or current style, no matter what style you go with, don’t forget to install a underground barrier, such as chicken wire. 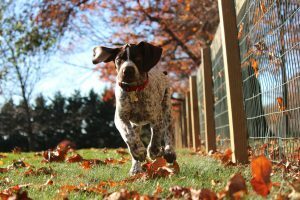 Most dogs are escape artists and can tunnel under a fence with amazing speed. Some common landscaping plants are deadly to your four legged companion, they can make them sick or worse. Widely planted specials like king sago can be toxic, Spanish bayonet which isn’t poisonous but is sharp and should also be kept away from pet areas. There are many varieties of grass Bermuda being the most durable. Another alternative that solves the problem of urine spots is clover lawns. They have many advantages over regular lawns, clover doesn’t stain or burn from urine like traditional grass. If your trying to create a cooler area try tall fescue grass. Create a area for your pet to run and play, use low borders and raised beds for planting areas. Some ambitious pets can overcome these barriers, but they still act as a deterrent as your pet is learning where they can and can’t play in the garden. If the plants in your yard posses any significant degree of diversity there is a good chance your growing toxic plants with out even knowing it. https://www.petpoisonhelpline.com/pet-owners/basics/top-10-pl.ants-poisonous-to-pets/ is a tool we use when searching out harmful plants. As humans we rarely feel the temptation to nibble on plants as we stroll through our yards, however, if your four legged companion has a uncontrollable appetite it’s a good idea to learn more about what plants are toxic to them. Lastly, don’t forget to leave the water flowing. Pets need an endless supply of cool, fresh water or they will get dehydrated. To insure your pet has enough water install a water feature, you won’t have to worry about your pet going dry while your away. 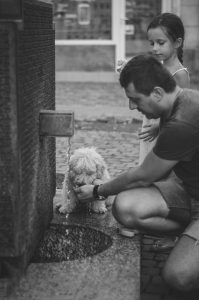 A small pool will not only keep your furry friend hydrated but will also keep your dog cool in the hot weather, it will add some other interests to your pet friendly yard. Dogs are a man’s best friend so it’s time they had their say in the backyard. While most of these dogscaping ideas are DIY friendly you may need a expert to tackle the larger projects. Before you hire someone else, don’t forget to call us first!